Creating a budget doesn’t have to be a hugely complicated thing. To a degree, you should already know how much money you have access to, which will need to be divided between marketing, operations and development. In this context, we are dealing strictly with the development budget. We’ve seen it many many times in the past. People come to us with and extensive, ever increasing, list of features for their big idea, believing that they know exactly what their users want. We build the product. Clients then often find out that their users ignore a large percentage of those “must have” features that ate up a significant portion of their development budget, and are now dead in the water. When it comes to a new product, you have to start somewhere. So go ahead and make the list of features for the product that is in your head. The trick here it is to condition yourself to avoid the idea that you know exactly what features your users want. You need to understand that your feature set is merely a hypothesis that needs to be proven. We’ll get to that a little bit. Once you are done with your feature set, it should be a relatively simple exercise to create your user stories. The point of a focus group is to guide a group of people who represent your demographic through different scenarios and the use of your product. You are allowing them to interact with it in a somewhat meaningful way and will then collect their opinions through the use of structured surveys. The results of these surveys should be invaluable in compiling the final feature set. You should now have the resulting final feature set based on your focus group results. Based on this list, you are now ready to get some estimates. What you need is an estimate per feature, so that after you have prioritized them you’ll be able to make the determination as to which ones are developed based on the highest level priorities that fit within your budget. This venn diagram provides a fairly accurate view of the resulting decision. 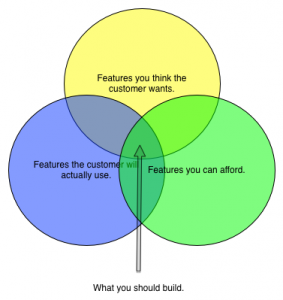 It’s the intersection of what you think the customer wants, what the customer actually wants and what you can afford to build based on the estimates you gather.